Squats and deadlifts are two of the best mass-building exercises since they target so many large muscle groups. Between them, they work the whole of your lower body, as well as your core, back muscles and arms. Both exercises are intense though, so it's vital that when performing them twice every week, you cycle your volume and intensity to avoid injury and over-training. Squats are a knee-dominant move, meaning they focus on your quads, while deadlifts are hip-dominant and target your hamstrings, though there is overlap in the muscles they work. Deadlifts can be part of your leg or back workout, however, personal trainer Steve Dilello advises leaving at least 72 hours between squat and deadlift sessions to let your muscles recover. Therefore, you're best to squat and deadlift on the same day; otherwise, by leaving 72 hours between each workout, you wouldn't be able to fit both lifts in twice in the same week. 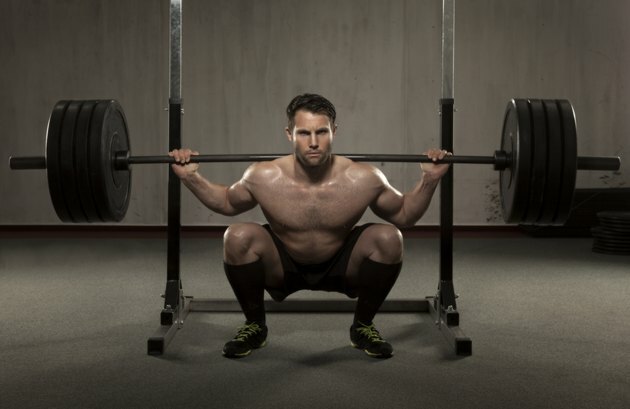 Train squats and deadlifts on your leg days on Monday or Tuesday, then again on Friday or Saturday. The often-advised repetition range for building muscle is eight to 12 reps per set. By doing this every workout though, you're setting yourself up for plateaus. Instead, trainer and bodybuilder Layne Norton recommends alternating between heavy strength-based workouts and lighter, higher-rep sessions. In your first weekly session, concentrate more on strength and aim for three to five sets of three to six reps and in your second workout, reduce the load and go for three to four sets of 10 to 15 reps.
Due to the intense nature of both moves, you may wish to alternate heavy and light workouts. In your first weekly session, perform your squats in the low rep strength range and deadlifts for higher reps, then switch this in session two. Deloads can also be useful. A deload involves spending a week working with lighter, less-intense weights, which gives your muscles and nervous system a break. Try deloading once every four weeks. Keep your reps the same on both exercises, but reduce your weights by around 30 percent. As you build muscle and get stronger, the temptation will be there to start pushing the weights up, but do this gradually. Small jumps are much less likely to result in injury and means you can sustain progress longer than making big leaps up. Aim for a rep or two extra each session and add no more than 5 pounds to the bar when you do decide to increase weight. In the beginning, make squats and deadlifts your only exercise, then add in other moves as you become more confident with your technique and find you're not getting sore between sessions. Try performing three sets of 10 to 12 reps on the leg curl, leg extension and calf raise after each squatting and deadlift workout for optimal mass gain. Do Squats Burn Off Belly Fat?